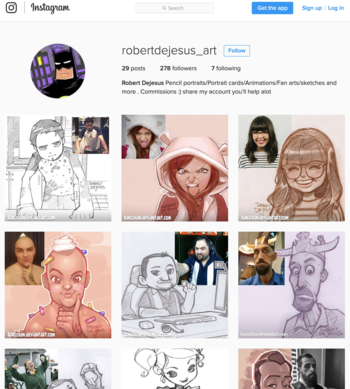 Frequent convention guest Robert DeJesus has alerted his Facebook and Instagram followers that someone has created an imposter Instagram account with the name robertdejesus_art. The imposter has reportedly been soliciting commissions from followers. Robert confronted them via Instagram comment, but the comment was deleted and he was blocked. One Instagram user reports being told the imposter was asking $20 for a color sketch. After being asked why they had "two accounts", the imposter claimed it was to reach more people. The imposter account currently has 32 pieces of Robert DeJesus's art posted from mere minutes before this post to 4 days ago. Each of them has been copied from Robert's official Instagram account. Each image posted by the imposter has the description "Dm if you want to animate your self" followed by a large number of hashtags. After being called out via comments and direct messages, the imposter has disabled comments but continues to post art. Do not follow the imposter account because an increased follower number only serves to legitimize it. Obviously, under no circumstances should you order a commission from this poster. You will obviously not be getting actual art from Robert DeJesus...and are likely not to get any art at all. If you want art from Robert DeJesus, contact him directly. We will update this article as the story progresses. UPDATE: We just checked and the imposter account has been removed.